Timely articles from the Voice of America online. Image: Secretary of State Hilary Clinton 24 July 2012. 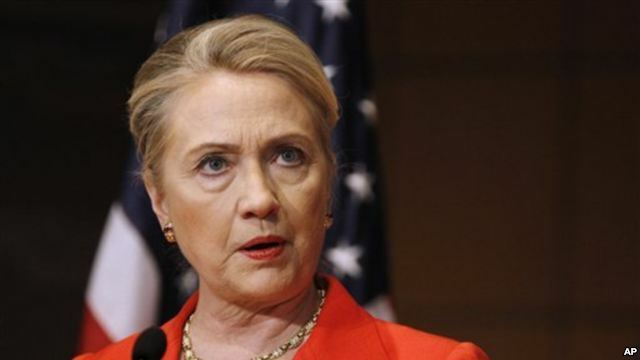 Secretary of State Hillary Clinton says the United States is increasing its efforts to help Syrian rebels fighting to topple President Bashar al-Assad. Clinton gave no details, but she said Tuesday that the U.S. is giving such non-lethal aid as medical and communications support. She said Washington is working outside of the U.N. Security Council, where Russia and China have vetoed three resolutions that would have taken strong action against the Assad government. The secretary said the Syrian opposition is seizing control of more and more territory, which she says will eventually become a safe haven and a base for more operations. She said the opposition must be ready to start work on an interim government that protects the rights of all Syrians and safeguards the stockpile of chemical and biological weapons. The spokesman for the Syrian National Council says the main opposition grouping is still demanding President Bashar al-Assad leave power, denying that the coalition would consider having someone from the current government temporarily lead a political transition. Syrian National Council spokesman George Sabra told VOA by phone from Paris Tuesday that he had been misquoted in an earlier news report in which he was reported to have said the SNC would agree to the departure of President Assad and the transfer of his powers to a regime figure, who would temporarily lead a transitional period. “There is not any change with the position and opinion of SNC about the regime and the transition period,” he said. “The transition period should start after leaving Bashar al-Assad and his regime the power. The opposition meeting earlier this month in Cairo was marked by squabbling among delegates. But ultimately a plan emerged for a framework for a post-Assad political transition period that includes an interim government and parliament. SNC spokesman Sabra indicated that talks continue within the opposition about the way forward if and when President Assad leaves power. “We are discussing now between us in the council, and also with the Free Syrian Army, about the idea of the transition document,” he said. Meanwhile, Syrian jets flew overhead while helicopters fired missiles Tuesday in a new government push to put down the rebellion in Aleppo, Syria’s largest city. The exact situation on the ground is not clear. But witnesses report heavy fighting in the streets. Opposition reports say thousands of Syrian troops are heading toward Aleppo from their positions near the Turkish border. Aleppo was relatively calm until late last week when the rebels launched their operation to take the city. The opposition-run Local Coordination Committees also reported Tuesday that government forces were shelling areas outside Damascus, as well as in Homs, and in the eastern city of Deir Ezzor. On Monday, U.S. President Barack Obama joined other world figures in warning Syria against using chemical weapons. Obama’s comments came after a Syrian Foreign Ministry spokesman Jihad Makdissi said the government would never use chemical weapons against its own people, but would unleash them against what he called foreign invaders. He said the military is securely guarding the nation’s weapons stockpile. Syrian activists say more than 19,000 people have been killed since the uprising began in March of last year. Image: U.S. National Security Advisor Tom Donilon (L) and China’s President Hu Jintao during their meeting at the Great Hall of the People in Beijing, July 24, 2012. The U.S. National Security Advisor is in Beijing to meet with China’s top leaders and to discuss military and security issues as well as the China’s position on the Syrian conflict and Iran. 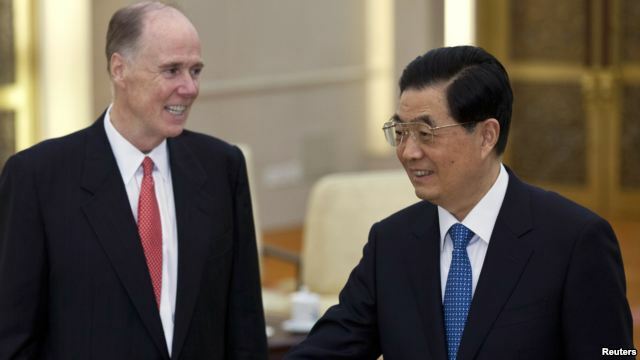 Thomas Donilon held talks on Tuesday with Chinese President Hu Jintao and State Councilor Dai Bingguo. Donilon told Hu that President Barack Obama is “fully committed to building a cooperative partnership with China” on issues in the region and the globe. Jin Canrong, associate dean of the school of International Relations at Renmin University, says that although the U.S.-China relations are generally stable, the two countries have to work out conflicting opinions on a range of matters. “The two sides do not trust each other. Donilon’s role as a national security advisor is important in defusing doubts between the two countries,” Jin said. Last week China again joined Russia in vetoing a U.N. resolution calling for sanctions on Syria. China perceives such a move as an interference in Syria’s internal affairs. Western countries, including the United States, strongly criticized China’s decision, calling the vote “deplorable”. Jin Canrong says officials are likely to discuss Syria, but Chinese authorities are unlikely to be persuaded to adopt a more interventionist stance. The two sides are also expected to discuss Iran, which is now subjected to tough economic sanctions that deter third countries’ imports of Iran’s crude oil. Last month, and in a surprising move, the Obama administration added China, Iran’s top customer of oil, to a list of exempted countries allowed to purchase oil from Iran for 180 days without incurring economic repercussions from the United States. “But the exemption is of only 6 months, after that what will they do?” Jin said, suggesting that Donilon’s visit could help define what the two countries’ will do next. On Tuesday, Chinese media widely reported on Japanese protests against a U.S. military aircraft, the Osprey V-22, that had just arrived in Japan where it will be deployed to the American military base of Okinawa. Japanese opposition came from local officials and citizens concerned about the plane’s safety record. China did not release any official statement on the matter and Jin Canrong thinks that Donilon’s visit will not prompt China’s leaders to express their view on the subject. “It’s a tactics’ weapon that does not change the strategic balance,” he said adding that China still views it as a U.S-Japan issue. Other areas of discussion might include North Korea and conflicts over disputed territory in the East and South China Sea. Donilon is scheduled to meet other Chinese senior military and state officials on Wednesday, including Xu Caihou, vice chairman of China’s Central Military Commission, foreign minister Yang Jiechi, Vice Premier Wang Qishan, and Xi Jinping, the current vice president and Hu Jintao’s most likely successor after the next Party Congress scheduled for this fall. After China, the U.S. envoy will fly to Japan to consult with senior Japanese officials on U.S.-Japan security cooperation and other bilateral issues. Image: A Syrian rebel takes position as a helicopter hovers over the northern city of Aleppo, July 23, 2012. 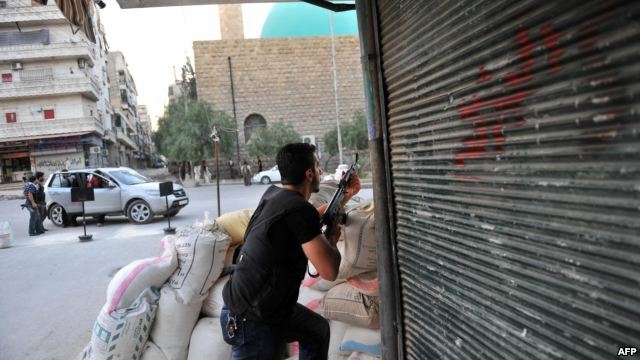 Fierce fighting continued in Syria on Wednesday. Rebels sent reinforcements to the battered historic city of Aleppo as government forces stepped up attacks with helicopters and machine guns. Activists say rebels set fire to a police station near Aleppo. They also say clashes and heavy shelling have continued in regions including Homs, Hama, Deir el-Zour and the Damascus suburbs as President Bashar al-Assad tries to maintain his grip on power. The opposition Syrian Observatory for Human Rights says more than 40 people have been killed across Syria on Wednesday. Neighboring Turkey has closed key border crossings to commercial traffic from Syria but says they remain open for refugees. Ankara says it is taking the measure due to security concerns. Last week, Turkish drivers said their trucks were looted and burned as rebels captured the Syrian side of the Cilvegozu crossing from government forces. Analysts say the closures will affect Syria’s economy by hitting cross-border trade. At the Kilis refugee camp near Oncupinar, Syrian refugee Abu Hasan expressed support for Turkey’s policy. “I think this is an appropriate decision,” he said. “Turkey is making the decision to protect its border as well as to protect us.” The Killis camp houses more than 11,000 Syrians. The number of refugees is increasing, with most using clandestine smuggling routes over the border. Turkish Deputy Prime Minister Besir Atalay says more than 44,000 refugees are now sheltered in Turkey. The Arab League has pledged $100 million to help the Syrian refugees. Turkish Foreign Ministry spokesman Selcuk Unal says Turkey welcomes donations of equipment, but does not need personnel. On Friday, the U.N. Security Council approved a resolution renewing the observer mission for up to 30 days. The resolution allows for a pullout if the violence does not stop. Earlier this week, the European Union decided to strengthen its arms embargo against the Syrian regime, blacklist nearly 30 government-associated people and companies, and ban the Syrian national airline from landing in EU countries. On Wednesday, Russia’s foreign ministry expressed opposition to the EU sanctions, saying they could be seen as a “blockade” of the country. 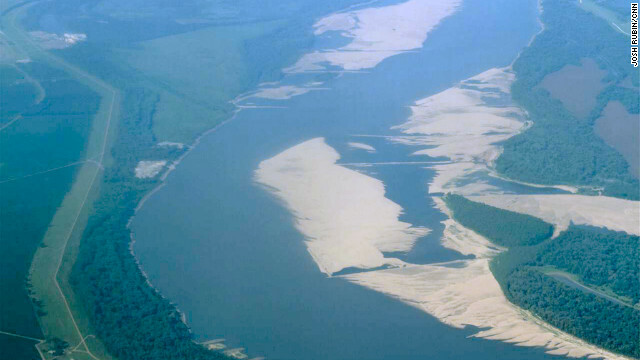 The “mighty Mississippi” has lost some of its might with the season’s epic drought taking its toll on river levels, which are falling to near historic lows. The U.S. Army Corps of Engineers will spend nearly $7 million dredging in an attempt to keep ports operational and keep the river open for barge traffic in the coming weeks. River levels in Memphis have dropped to within three feet of their historic lows from the 1988 drought. In just one year, the river has gone through extreme fluctuation. Last May, it was within a foot of its record-high crest because of massive flooding, and today it’s 55 feet lower and experiencing historic lows due to drought. Last year the expanse of the water was over 3 miles wide in parts of Missouri and Arkansas as levees were blown up in order to help protect the town of Cairo, Illinois from flood waters. This year shows a much different story with the river less than a half mile wide in spots. The latest outlook released by the National Weather Service on Thursday forecasts increasingly dry conditions over much of the nation’s breadbasket, a development that could lead to higher food prices and shipping costs as well as reduced revenues in areas that count on summer tourism. About the only relief in sight was tropical activity in the Gulf of Mexico and the Southeast that could bring rain to parts of the South. The unsettling prospects come at a time of growing uncertainty for the country’s economy. With evidence mounting of a slowdown in the economic recovery, this new blow from the weather is particularly ill-timed. Already some farmers are watching their cash crops burn to the point of no return. Others have been cutting their corn early to use for feed, a much less profitable venture. The government has declared one-third of the nation’s counties — 1,297 of them across 29 states — federal disaster areas as a result of the drought, which will allow farmers to apply for low-interest loans to get them through the disappointing growing season. What is particularly striking about this dry spell is its breadth. 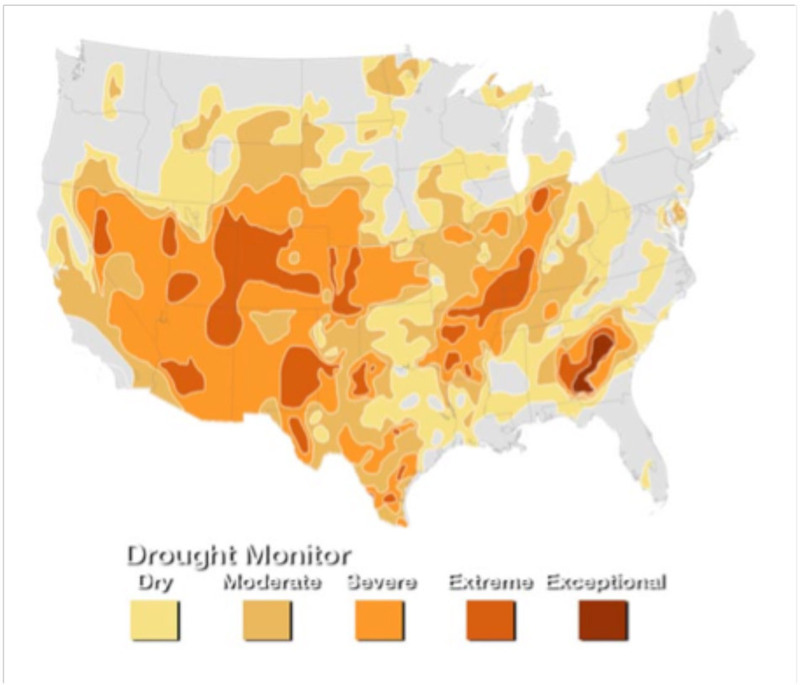 Fifty-five percent of the continental United States — from California to Arkansas, Texas to North Dakota — is under moderate to extreme drought, according to the government, the largest such area since December 1956. This article is several years old, but still interesting. Dr. Vardiman is Chair of the Department of Astro/Geophysics. Dr. Svensmark’s findings were verified by CERN experiments, the findings published in August 2011. Although still generating controversy, they are fascinating nevertheless. More study is ongoing by climate scientists. Man-made carbon dioxide is generally thought to produce global warming. However, in a recent article entitled “Does Carbon Dioxide Drive Global Warming?” I presented several major reasons why carbon dioxide is probably not the primary cause. But if carbon dioxide is not the cause, then what is? Evidence is accumulating that cosmic rays associated with fluctuations in the sun’s electromagnetic field may be what drives global warming. A new theory called cosmoclimatology that proposes a natural mechanism for climate fluctuations has been developed by Henrik Svensmark, Head of the Center for Sun-Climate Research at the Danish National Space Center. 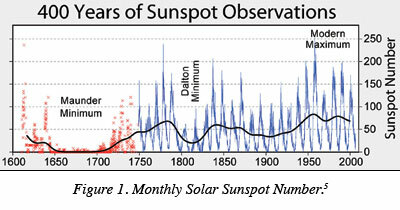 For many years, climatologists attempted to correlate the number of sunspots with various climate variables, including temperature and precipitation. By the 1980s these attempts were determined to be futile, because the percentage change in solar heating was found to be insufficient to explain the variations. However, this interest began to increase the connection between cosmic rays and sunspots, carbon-14 in the atmosphere, beryllium-10 on the surface of meteorites, and other processes. In particular, it was found that carbon-14 dating needed to be corrected for fluctuations in cosmic ray flux. Without such adjustments, many carbon-14 dates were inconsistent. The question was raised, could cosmic rays affect other geophysical phenomena as well? In 1995, Henrik Svensmark discovered a startling connection between the cosmic ray flux from space and cloud cover. He found that when the sun is more active — more sunspots, a stronger magnetic field, larger auroras, stronger solar winds, etc. — fewer cosmic rays strike the earth and cloud cover is reduced, resulting in warmer temperatures. Figure 2 shows the relationship he found between low-level cloud amount derived from satellite data from the International Satellite Cloud Climatology Project and cosmic ray counts from Climax, Colorado. 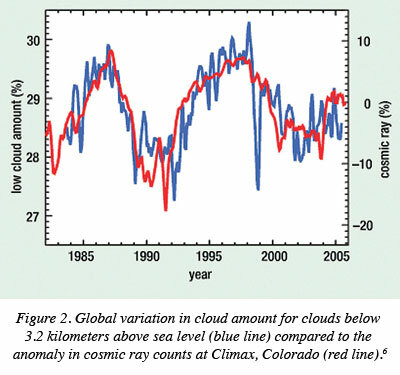 It is evident in Figure 2 that for the 22-year period from 1983 to 2005, the average amount of low-level cloud follows the flux of cosmic rays very closely. In fact, Svensmark claims that the correlation coefficient is 0.92, a very high correlation for this type of data. In addition, when looking at various longer periods of record using proxy data for these two variables, he also found good correlations and similar trends. In particular, he suggested that during the Little Ice Age when the sun was inactive, cosmic ray flux from space was high, cloud amount was greater, and global temperatures were cooler. As the sun became more active after 1750, cosmic ray flux decreased, cloud amount decreased, and global temperatures warmed. Svensmark proposed that the global warming we’ve experienced for the past 150 years is a direct result of an increase in solar activity and attendant warming. These statistical correlations are intriguing, but many critics are skeptical of Svensmark’s theory until he can explain the mechanism by which cosmic rays create more clouds. This led him to design a laboratory experiment to demonstrate that cosmic rays produce more cloud nuclei on which cloud droplets can form. In 2007, Svensmark et al published the results of an experiment which confirmed his theory that cosmic rays increase the number of cloud condensation nuclei (CCN). Most CCN that nucleate cloud droplets in water clouds near the earth’s surface are composed of compounds of sulfuric acid derived from water vapor, sulphur dioxide, and ozone found in the atmosphere over the ocean. Svensmark built a cloud chamber containing these gases to see if CCN can be multiplied when cosmic rays are introduced into this mixture. He found that the cosmic rays ionize molecules in the air, releasing electrons that in turn attach themselves to oxygen molecules and collect other water and sulfur dioxide molecules to form clusters. This process occurs extremely rapidly and many times for each electron. The electrons function as a catalyst to form clusters of molecules that grow and produce sulfuric acid CCN. When the air is lifted by normal meteorological processes, these additional CCN form more dense and widespread clouds because of their greater number. Svensmark’s theory of cosmoclimatology is now complete. He has discovered a complete chain of events that explains the variations in global temperature that have puzzled climatologists for so many years, and that has now led to an explanation for the recent global warming episode. It starts with cosmic rays coming to earth from exploding supernovas and collisions of remnants of stars with nebula in space. Many of these cosmic rays are shielded from striking the earth by the electromagnetic activity of the sun. When the sun is active, the solar wind prevents cosmic rays from entering the earth’s atmosphere by sweeping them around the earth. When the sun is inactive, more of them penetrate the atmosphere. Upon reaching the lower atmosphere where more sulphur dioxide, water vapor, and ozone is present, the cosmic rays ionize the air, releasing electrons that aid in the formation of more CCN and form more dense clouds. This increase in low-cloud amount reflects more solar energy to space, cooling the planet. Variations in electromagnetic activity of the sun and fluctuations in cosmic ray intensity from space result in the periodic warming and cooling of the earth. Solar-modulated cosmic ray processes successfully explain the recent global warming episode. It would be prudent for the political leadership in the U. S. and the world to look more closely at Svensmark’s theory of cosmoclimatology for an explanation of global warming before restructuring our entire economic system to eliminate carbon dioxide. If, in fact, Svensmark is correct, reducing the concentration of carbon dioxide will have little impact, anyway. * Results confirmed by CERN experiments Aug 2011. Click on link for more information. The average temperature for the contiguous U.S. during June was 71.2°F, which is 2.0°F above the 20th century average. The June temperatures contributed to a record-warm first half of the year and the warmest 12-month period the nation has experienced since record-keeping began in 1895. Scorching temperatures during the second half of the month led many cities to set all-time temperature records. Precipitation totals across the country were mixed during June. The nation, as a whole, experienced its tenth driest June on record, with a nationally-averaged precipitation total of 2.27 inches, 0.62 inch below average. Record and near-record dry conditions were present across the Intermountain West, while Tropical Storm Debby dropped record precipitation across Florida.